You've just landed in NAIA Terminal 3 at 6 p.m. on a Friday. You pull up Waze, type in your home address in Quezon City and — ta da! — two and a half hours estimated travel time. If money were no object, you might as well turn around and take a two hour flight to Hong Kong instead. For a more holistic view of the situation, we took a look at how far you could travel from the airport given a certain travel time duration and departure time. Imagine a shape around the airport which represents the reachable area within a set amount of time. In the world of cartography, this space is called an isochrone. 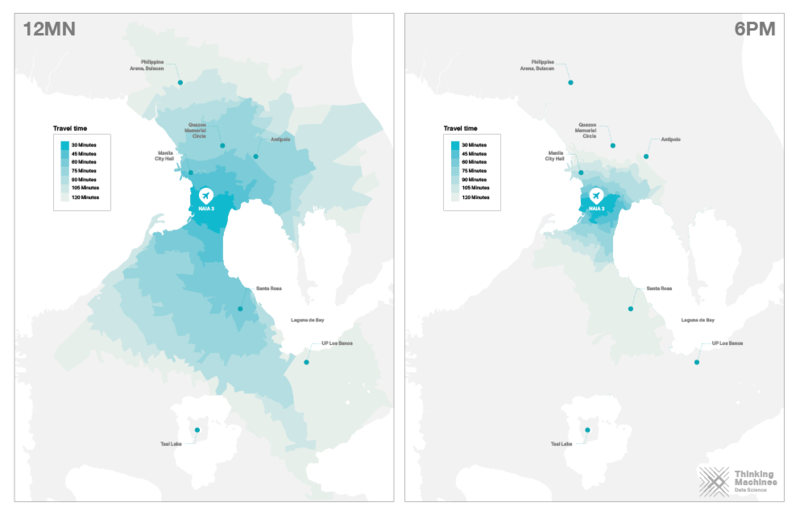 To create an isochrone, we used a transit distance API to find the farthest destinations from our origin — in this case, the airport — that can be reached within our desired travel time. Finally, we connect these points to form a polygon that represents the maximum travel area for that travel duration. We did this multiple times for different departure times and travel durations. Whether you're travelling north, south, east, or west, the distance you can travel is always shortest when you’re departing at either 3 p.m. or 6 p.m., peak rush hours near the airport. Interestingly, the bad traffic around 3 p.m. is concentrated mostly around the airport, but lightens up after as you get farther from the airport. At 6 p.m., traffic remains bad everywhere in Metro Manila. Midnight and 6 a.m. are the best times to arrive from a flight, especially if you're travelling north to Quezon City. To contextualize the effect of traffic on travel times, we compared the travel times of different destinations (from nearest to the airport to farthest). During peak traffic, it would be 20 minutes faster to fly to Hong Kong, than to travel to Katipunan, a 2.5 hours drive away. 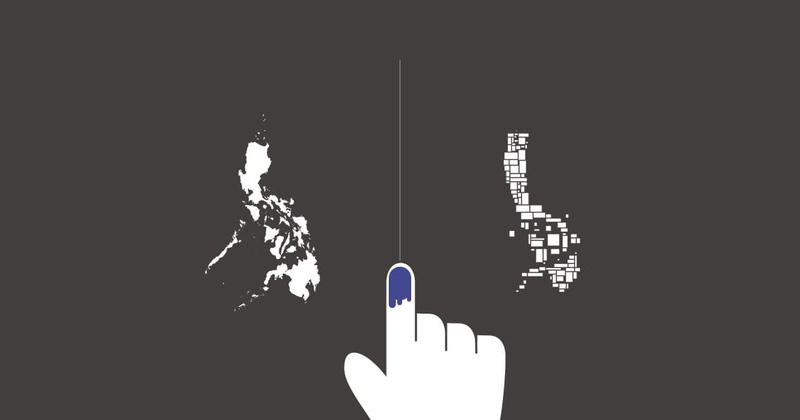 Keep in mind that Katipunan is only 22 km from the airport—nevermind trying to get to Lipa 76 km away! What time will you get to your destination if you depart at 6 PM? So if you're arriving from a flight at 6 p.m. on a Friday night and going home to Katipunan, it might be better for you to have dinner in BGC and wait out the traffic before going home. We also looked at average travel speed across destinations. No matter what time of day you leave the airport, northbound routes always take much longer than southbound routes. 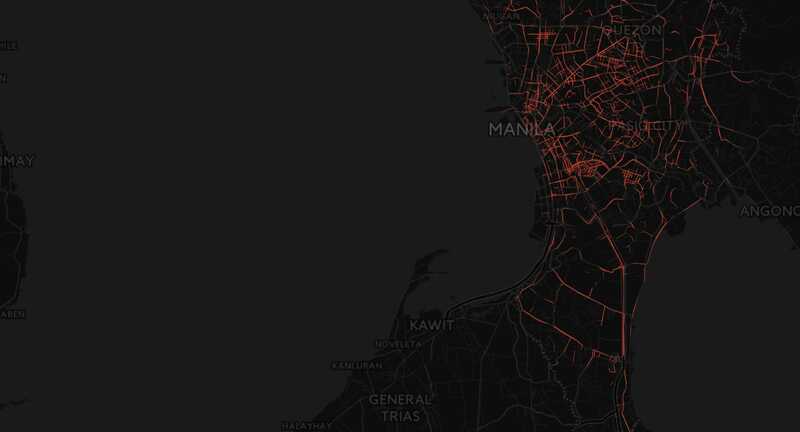 Also, travel speeds on the BGC, Ortigas, and Makati routes - all three business districts - are the slowest, while Tagaytay, Nuvali and Lipa are the fastest. Southbound travel clearly benefits from access to SLEX and the NAIA expressway, while northbound travel is hampered by traffic within NCR itself. Seeing this, it is not hard to imagine the benefits of improving connectivity to the north parts of NCR. How fast will you be travelling along different routes? Geoanalytics, or the processes of generating insight from the analysis of location-based data, is incredibly useful for transit and infrastructure planning, site selection, and logistics. With the increase in available data from transit apps, the number of insights and quality of analysis you can pull off has increased accordingly. Here are a few resources on isochrone and isodistance maps for the technically-inclined. Does your organization need help using geoanalytics to optimize site selection, effectively allocate resources, or map out large location datasets? If so, email us at [email protected] and let’s see if we can help you out!